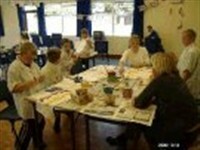 The Afterschool Club was established in September 2001 after encouragement from EYDCP and East Sussex County Council. We believe that our facilities, activities and our care is second to none. At the end of a day of learning we believe the children should be able to relax and play in an environment that is different to school and away from the teachers and school staff that have looked after them all day. At our Afterschool club there are no teachers & no classrooms. We have creative fun and games in rooms with warm carpets led by staff who are experts in playwork. Each day during school term time the After School Club is available from the end of school day until 6.00pm. For pupils attending Stafford Junior School there will be a supervised walk from school to the Centre. Pupils from Roselands Infants School, St Andrew's Infants School and Tollgate Community Junior School are collected each day by minibus. For pupils attending other schools it will be necessary to be collected by pre booked taxi transport. The After School Club provides a fresh healthy snack meal and a drink each afternoon. This is not a 'Home work Club' and children are not expected to sit quietly and work. If they wish to do so they can however. We consider that children want to be away from the school site which they equate with learning and strict disciple. Our rooms are carpeted and warm and facilities are relaxing. At the end of the day when children finally get away from school they want to be able to relax until mum or dad collects them. We have a range of play and rest activities including a good selection of board games, PS2 & Wii, craft ideas, DVD's, dolls, books, group games, football goals etc. There is the option to cook something to take home. Pupils must be collected by 6.00pm. Registration for a place is strictly required. If you would like to visit the Club to see what goes on please ring 01323 439700 (option 2) to make an appointment with the Manager. The Club is approved by Ofsted Early Years - registration number 954435 and EYCESS - Early Years Childcare & Extended Schools Service. We often operate a waiting list for new members. Please call and speak to Karon Curryer - Club Manager if you wish to join the waiting list. Sometimes we have immediate vacancies - please ask. We are grateful to the 'New Opportunities Fund' for finance to provide this club during the year Sept 2001 to Sept 2002. We are currently self financing. You are welcome to visit the After School Club before choosing to place your child with us. Please contact the office for an appointment. You will not be disappointed. Afterschool Club is part of the 'wrap around' child care package we offer. Children must be attending full time school to be eligible for a place.